With ten days to go to a somewhat arbitrary deadline, the Honda F1 team is rumored to have ensured its survival for at least the first four races of 2009. Various benefactors, including Bernie Ecclestone, the Honda motor company and a few Brazilian interests are said to be willing to contribute funds and Mercedes will provide engines on receipt of a guarantee of payment. The Brazilian connection stems from Bruno Senna gaining a drive alongside Jenson Button. Is it irony or just deja vu that I am reminded of Super Aguri's death throes last year? Ominously, the Honda B team managed four races in 2008 before collapsing in a welter of unpaid bills. Of course, this time everyone wants the Honda team to survive somehow, whereas Super Aguri's popularity dissolved in the face of economic reality - suddenly the whole venture was regarded as an obvious folly when the debt collectors arrived. It is true that Honda has a lot more to offer the investor than did their giant-killing offshoot. The team builds its own chassis, has one of the giant reputations of F1 in Ross Brawn, promise of a competitive car for the coming season and dwindling grid numbers to encourage support from those who want the sport to remain healthy. Indeed, the lack of interest from buyers must surely be a warning of future team exits, Toro Rosso in particular. Although these are rumors only, they must confirm earlier stories of a management takeover; there is no possibility of a last minute buyer happening along and all that remains is a desperate effort to gather enough money from benefactors and sponsors to enable the struggle to continue. It all sounds depressingly familiar to anyone aware of the usual pattern of F1 teams' dying moments. Minardi was exceptional in that it survived in such an environment for year after year - all others have expired quickly after meeting such funding problems. So the signs are bad but it does seem that there will be a couple of ex-Hondas (what will they call them?) on the grid at Melbourne. Bruno Senna will get a shot at F1 and, hopefully, performance will be sufficient to encourage any wavering potential investors. It is an unlikely scenario, but we have to hope that Brawn has worked some magic with the latest design so that it is quick without having been tested over the off season. It is a faint hope at best, however. From the Pitpass newsletter this week: "...Mike Lawrence has to have already won the 2009 Quote of the Year Award for his recent comment about Max Mosley being the only person in F1 who has literally been strapped for cash. " It's ironic to see them doing exactly the same thing as Super Aguri did em '08. And they "kill" them! I don't know what kind of move is this one: a desperate form of guarantee 20 cars in Melbourne, on a "management buyout" with some sort of support from Brazil/Honda/Ecclestone, with german engines. Ah, I did see the irony Clive, and allowed myself a moment of schadenfreude at Nick Fry's expense. But that passed and I do hope the team-formerly-known-as-Honda do make it to the grid in Melbourne. 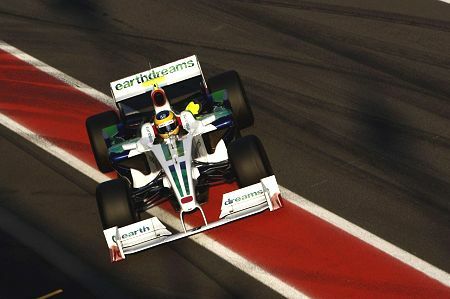 I am looking forward to seeing what Bruno Senna can do in F1. On an unrelated note, I got a call from the Aus GP corporation last week telling me that due to poor ticket sales, they are no longer building the stand I had purchased tickets for. Doesn't bode well, does it? I do hope that the Honda team somehow manage to survive into the future - it's just that things don't look too hopeful at the moment. Speeder is right about it looking like "buying time" while a more permanent solution is found. USF1? I am glad it has turned out to be more than a rumour but am not getting my hopes up too far - there are so many pitfalls for the would-be F1 team these days. too constraining and spec formula like. It's on autosport. Sad and quite understandable. Yes, I saw the item, Peter, and agree that things are bad when the star designers start muttering about leaving the sport. Hopefully, Max will go and we'll have a more imaginative FIA President soon. Unless the Team Once Known as Honda has designed the whole car around a Mercedes engine, how could it possibly be competitive? In this age, where cars are referred to as packages, it seems overly optimistic to think engines are that interchangeable. Adrian Newey has frequently said he was going to quit F1 over the last ten years. Towards the end of his first contract with McLaren he was going to design an Americas Cup yacht instead. Then he was going to leave F1 but Bobby Rahal convinced him signing for Jaguar would be a big challenge only for Ron Dennis at the last minute to sign a big new contract for McLaren. He clearly has his feet well under the table and his new car is getting a lot of praise and given a year to develop his design for the new regs we can reasonably expect next year's car to be a step forward. What better time to get the wanderlust and then to be persuaded to stay in return for a few more million dollars? I don't know who might be those brazilian sponsors that would help kept the team around. Bruno Senna was complaining that Toro Rosso was asking for too much money just the other day. His two main sponsors are Santander (which obviously already sponsor a team) and Embratel which ironically is owned by Carlos Slim. Steven: I had not thought of the Newey statement as an attempt to increase his salary in the future; it's certainly possible, I agree. To me it seemed more of an early warning to the powers-that-be that they were going too far with the restriction of the rules - sort of "ease up or I'm outa here, Max." James Allen's blog which is much better than his TV commentary today suggested that the last minute Honda buyer may be none other than Richard Branson. Branson/Reynard....Bye, Bye Fry. As Brocky always said "How good is this!" I like it. And if anyone has the cash to splash on an F1 team, it would be Sir Richard. Plus he'd be just the sort of flambouyant person to bring a bit of character to the pitlane. However, with all team-formerly-known-as-honda rumours, I am adopting a 'believe it when I see it' approach. Me too, Peril, me too! A few years ago after the EU announced laws to ban tobacco advertising Bernie threatened to take away all the European races. Branson got on TV and said if Bernie did that he would put on a rival championship using all the circuits that had lost their races. It will be interesting to see what happens if Branson does get involved whether he concentrates on his own team or if he sticks his oar in Bernie and Max's business. But there are some places that don't fit in this puzzle: Richie Branson's Virgin Atlantic is passing troublesome times, and he looks more focused on Space Travel than Formula 1. What can he take advantage on this adventure? Let's see... in a time where rumours are flying everywhere, I have to take a careful approach about this. See it to believe it! I think there must be some awful costly contracts that come with the Honda package. For some reason one of the offers for it has been referred to as a "hostile takeover" attempt. Could it be that there is far too much baggage that comes with the useful stuff? Talk about beggars being choosers! It seems to me that this team has under achieved since its inception. Villeneuve, Button and Barrichello are/ were all, at the very least, capable drivers and the budget was there to account for far more than 1 win. Somewhere there must be an underachiever ensconced in a position that is secure. David Richards was convinced it was Villeneuve but getting rid of him didn't solve anything. Getting rid of Richards didn't either. Honda taking over BAR didn't take the team anywhere despite massive cash. Somewhere there's a reason! The Honda package becomes far less attractive if it has to be kept as is, lock, stock and barrel, for as is, it is a loser! It would seem as though Ecclestone has tried to get some leverage from within FOTA by buying into a Honda takeover. Honda would seem to have refused his offer for some reason. It wouldn't suprise me if Honda's reasons for leaving F1 is Ecclestone and his cronies shenanigans as much or more than just cash? Branson (of Virgin) seems to think Ecclestones a cool guy!!! Anyone who comes to this conclusion mustn't be looking very closely and / or had the wool pulled over their eyes! No one seems to have noticed yet but Branson is actually a dork. Anyone who thinks he can lecture F1 about its effect on the environment and yet have an airline must be capable of world-beating doublethink. One of his planes crossing the Atlantic spews out more poisonous waste than any GP. The fact that he likes Bernie is just more evidence that the guy has no sense. His buddies are the rich and powerful who, like himself, see nothing wrong in citicizing others who are not green enough in their opinion while ignoring their own depredations to the environment. Rather like Al Gore, in fact.